Markus Pfahlert, Product Manager of LORENZ drugTrack, participated in the ISO IDMP Task Force Meeting in February and compiled this summary of the outcomes. Representatives from EMA, NCA, industry, consultants and vendors participated in this meeting. Currently the Referentials Group is trying to create a common exchange process for distributing referentials lists. There are 2 different activity streams for each: 1) the gathering (or mapping of already existing data such as EVMPD) and 2) the distribution. For the latter, help from vendors will be needed on both the exchange process itself and for a User Acceptance Test (UAT) on building the exchange system. This entry was posted in Industry-specific Topics and tagged EMA, EU Regulatory Network, IDMP, Task Force on March 30, 2016 by llsmarketing. Markus Pfahlert, Product Manager of LORENZ drugTrack, participated in the ISO IDMP Task Force Meeting in September and compiled this summary of the outcome. The transition phase will consist of two parts; the Pre-Submission Phase and the Submission Phase itself. Directly following that, the Maintenance Phase will begin. This entry was posted in Industry-specific Topics and tagged EMA, EU Regulatory Network, IDMP, Task Force on October 13, 2015 by llsmarketing. Participating in the ISO IDMP Task Force and in consultation with a variety of other stakeholders, we have formed a proposal on how the ongoing EMA planning could be interpreted from an industry perspective. The European Medicines Agency (EMA) and the EU Regulatory Network are pursuing an open dialogue with industry to discuss aspects of implementing the ISO IDMP standards in the EU. LORENZ is taking part in the ISO IDMP Task Force (TF) which has been established to advise on the planning, development, implementation and maintenance of the EU’s ISO IDMP standards. This Task Force met on Friday, 12 June. Based on that meeting and on other discussions with a variety of stakeholders, a proposal has been developed on how the EMA’s planning could be interpreted from an industry perspective. It should be noted that the official implementation date remains 1 July 2016. However, there is currently only one timing plan being worked on, and this foresees a phased approach to implementation. 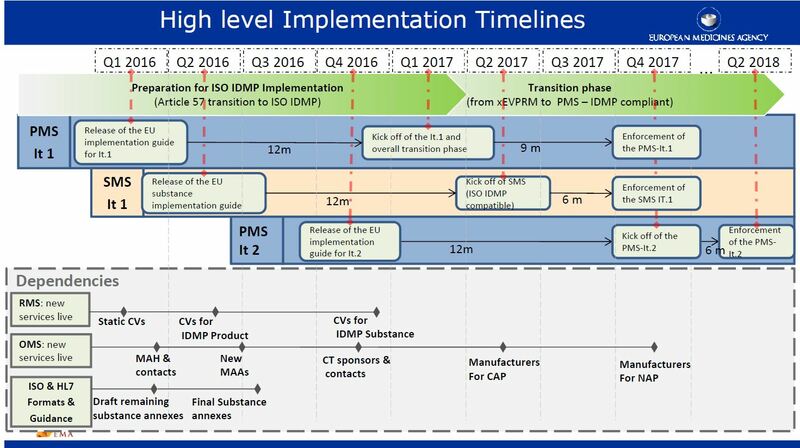 The picture above illustrates these proposed high level implementation timelines. This entry was posted in Industry-specific Topics and tagged EMA, EU Regulatory Network, IDMP, Task Force on July 3, 2015 by llsmarketing.